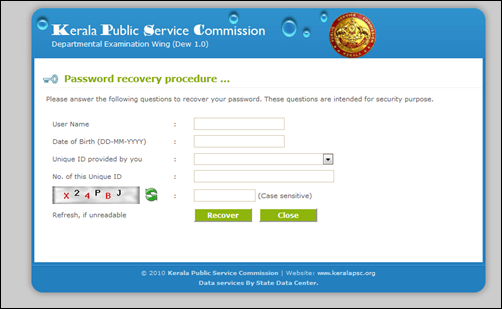 I forgot my password and user ID of Kerala Public Service Commission (Kerala PSC) one time registration. What to do? If you have lost the User ID and forgot the password, it can be recovered through SMS facility. The Kerala PSC has provided facility for those registered candidates to recover their lost USR ID and password. The Kerala Public Service Commission (Kerala PSC) better known for its transparency and accuracy in facilitating services has taken a step forward with initiatives which could gather more appreciation from the job seekers. Even though many are comfy with computer and internet, it may not be the same with others. As most of the educational institutions have changed their functions online, it has helped the public to collect information rather than waiting for the order. For the smooth running of the system, Kerala PSC has introduced the 'One Time Registration' facility which has helped the candidates to register once enabling them for new job posts without any hesitation. This one time registration process will allow an applicant to register their details online which can be used for all future job applications. This single window system has already proved to be a blessing to those who keeps wide dreams of getting into government jobs. After the registration process, an user ID and password will be generated which can be for logging in, apply for a post, download the hall ticket and also to view the examination result. But the one time registration procedure later becomes nightmare for some candidates as they forget the User ID and Password. In the case of other examinations, it is very difficult to retrieve the lost User ID and reset the password. But with an innovative approach, the Kerala PSC has made arrangements to recover the User ID and password through a simple method. As many candidates accidentally get missed their profile ID and password, one can get back their ID through the service provided by Kerala PSC. How to get User ID and Password? Visit http://psc.kerala.gov.in/kpsc/forgotpasswd.php to retrieve the password, you have to enter the user name, date of birth and unique ID provided at the time of registration. Later, you can reset your password. But what happens if you forgot your User ID? In this case, the Kerala PSC has come up yet another facility- recovering User ID and Password through SMS. Candidates can use this method to get back User ID and Password by sending an SMS to the Mobile number 537252 in the given format from the mobile number that you have used in the Profile registration. If your UserID is binutvm and Date of Birth is 16/02/1985, the SMS format will be KPSC RST binutvm 16021985.